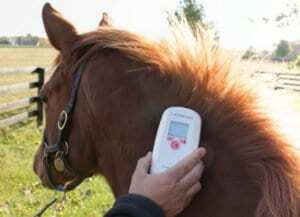 HiPoint Agro Bedding Corp., has long believed in organic digital technology to help biosecurity and safety in the equine sector using EPR tracking & MicroChipping. The benefits of understanding the horse, travel, security, risk, and identification will come through RFID and Digital tracking. It is a sound ethical way to move forward, away from simple lip tattoos. HiPoint’s RFID EPR tracking of manure waste from horse – horse farm- to disposal site is just another way we can understand horse movement and the environmental effects of the horse industry we know or wish to know little about. Microchipping is quickly becoming the global industry standard for equine identification, especially those being used for competition purposes. The FEI (the International Equestrian Federation–the international governing body of equestrian sports) began integrating microchips into the registration and identification process of horses competing internationally in 2013, and countries such as Australia, Germany, France, Great Britain, Ireland, and New Zealand have been using microchips in Thoroughbreds for years. This past year the U. S. Equestrian Federation and U. S. Hunter Jumper Association began requiring horses be microchipped in order to compete in sanctioned competitions beginning Dec. 1, 2018. It was in 2017 that The Jockey Club began requiring microchipping and digital registration of Thoroughbreds in the U. S., and that crop will begin racing later this year. Following suit, the Thoroughbred Racing Protective Bureau (TRPB) announced this past December that in 2020 any Thoroughbred making its first lifetime start will require a digital tattoo in order to race as traditional lip tattoos are phased out. The digital tattoo is a digital certification of a horse’s identity that is accessible through The Jockey Club. To receive a digital tattoo, a horse will have its microchip scanned by a TRPB technician, who will authenticate the horse’s identity through comparing the foal photos and markings on file to a visual inspection. Once the horse’s identity is confirmed, the technician will take and upload updated photos of the horse to the breed registry. Digital tattoos can also aid in biosecurity practices and the prevention of disease spread, as the horse identifier will no longer be required to come in contact with each horse’s saliva in order to identify all horses in a race. While using microchips for registration and identification purposes will streamline many processes and provide many benefits to horsemen, officials, horses and even the racing public, in an industry spanning multiple generations, economic levels and digital savviness, adoption of new, more modern technology by some may be slow and met with some resistance. Dr. Bart Barber, DVM, a shareholder with Rood and Riddle, says the benefits of microchipping versus traditional registration paperwork and tattooing are many. The microchip, which is similar to a grain of rice in size, is implanted into the nuchal ligament in the middle third of a horse’s neck on the left side and will last the duration of the horse’s life. It is recommended that the microchip be implanted by a licensed veterinarian. It should be implanted at the same time the DNA hair sample is collected and photos are taken for registration. Microchips have been used for years in small animals, and one of the most common issues that arises is the migration of the microchip from the implant site to other parts of the body. Andrew Chesser, Manager of Registration Services agrees that issues involving the malfunction of microchips are rare and that such concerns are far outweighed by the safety and integrity benefits of using digital technology for Thoroughbred identification. nice blog. Keep on writing such blogs like these. Thank You!